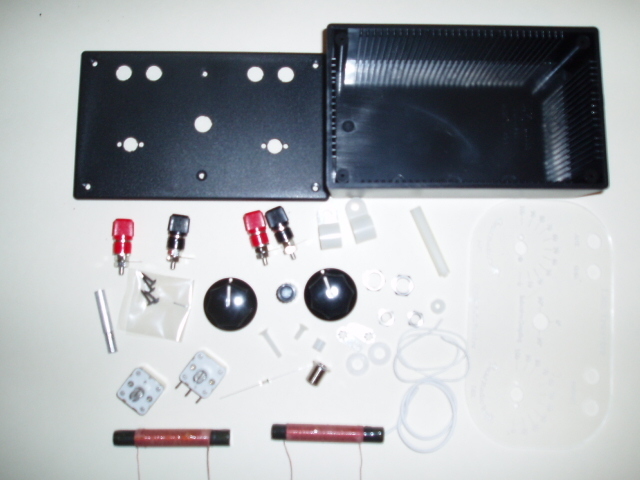 The design objective of this set was to design a set similar in appearance to the famous Heathkit CR-1 Crystal Receiver. However I did not want it to be a Heathkit CR-1 "want a be" instead I wanted a Set that would out perform the CR-1. I am very pleased with this set. 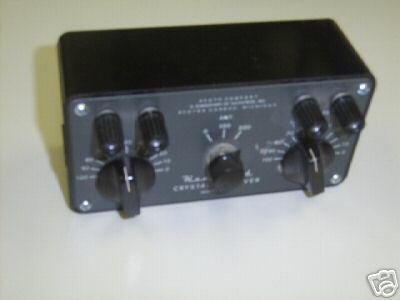 In bench test along side my Heathkit CR-1 the Litz Traveler spanks the Heathkit CR-1 in both sensitive and selectivity. This was achieved thru the use of two Hi Q Litz Coils that have a Q factor over 450 @790KHZ. 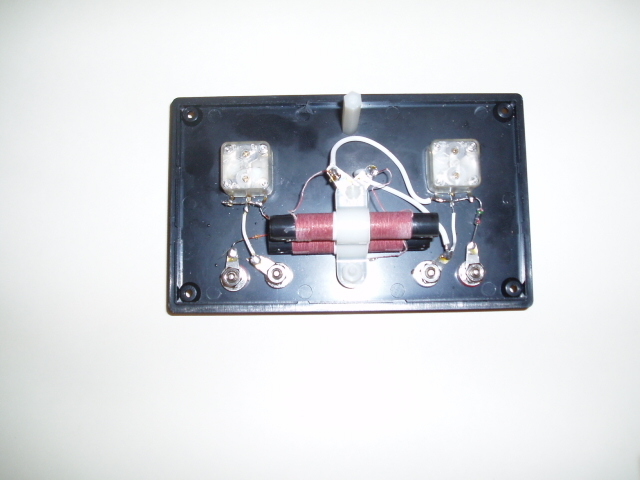 This Set has adjustable inductive coupling from the front panel a feature not found in others sets of this size and portability. Like the Heathkit CR-1 all components are mounted on the bottom of the lid to allow for easy construction and short leads. The Litz Traveler uses an tough ABS box measuring approximately 6 1/4 inches wide by 3 3/4 inches deep and 2 inches tall. 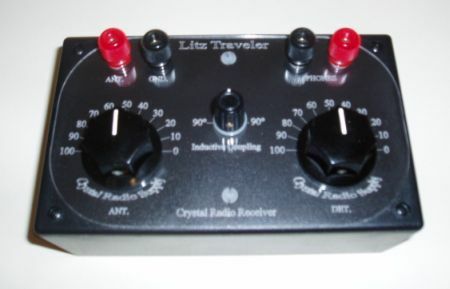 The Front panel layout is very similar in appearance to the Heathkit CR-1 however the Dial Plate on the Litz Traveler consist of a reverse engraved cast acrylic plate. That means the engraving is on the back side of the plate. The front of the plate is smooth and clean. All edges of the dial plate have been polished. You will need a antenna and ground as well as a set of Hi impendence headphone (2000 ohms) or more. A crystal or ceramic earphone may also be used. Shown Below is the inside view of the Litz Traveler with the Hi Q Litz Coils adjusted nearly 90 degrees from parallel. 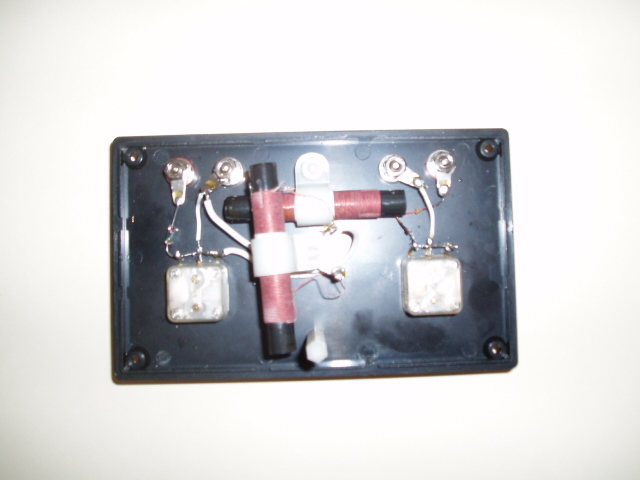 Show below the HI Q coils are adjusted to be parallel . By looking at the clean lay out above you would never know that it takes about 38 different parts to build this set.